None of us are perfect. As human beings, we make mistakes; some of a trivial nature, some a lot more significant. But we make them. And sometimes these mistakes affect other people and we have to ask for their forgiveness. But what happens if someone else makes a mistake that affects us, and we have to decide whether to give them a second chance? This question is a difficult one to answer; I struggle with this one myself. I’ve always been a very understanding person. I find it easy to relate to other people and their feelings, because of my empathetic nature. So when a person does something that hurts me, I think about WHY they would’ve done what they did. I try not to judge straight away; I think it through first. But just like everyone else, I have my limits. There is only so much hurt that one person can handle; each of us has a threshold for emotional pain. We are only willing to put up with so much before we decide to give up. That is when the question comes in… when do people deserve a second chance? Well, I’ve been plagued with this question for a few years now. I’ve tossed and turned; unable to forgive the people in mind for many hurtful things that they’ve done to me. But yesterday, my epiphany came. 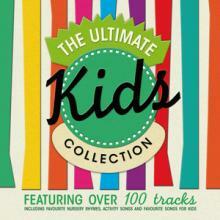 I’d received an album from ABC Music, called “The Ultimate Kids Collection”. As I listened to the 3-disc/100 tracks album, I thought about what my own childhood had been like. The fun, playful music brought me back to a time of innocence, where I was without a care in the world; so far removed from my life now. As I listened to the CD that my daughter absolutely loved, I got thinking about the idea of second chances and how forgiveness is such a hard thing to do. It’s so easy for someone to come along and say, “Let it go. The past is the past.” But when you were the one who experienced the ordeal, it is a gut-wrenching process to decide whether to forgive someone or not. For me, I’ve been thinking about the impact these people have had on my life, whether the positives outweigh the negatives. And that is where the answer to the question lies. At many times in our lives, we will upset others; we will anger them, hurt them, bother them, disappoint them, or let them down. But then there are other times where we make them feel appreciated, cared for, and we give them all we can. We only try to live the best life we can, we try to make others happy the best way we know how; but sometimes we get it wrong. As do the people around us. However, when someone shows remorse, shows genuine promise that they are willing to TRY to change; that is when they might deserve a second chance with you. It is up to you whether you want to take that risk. The important thing for you to realise is that they could hurt you again; you might even regret giving them a second chance. BUT ask yourself this, what would you regret more – staying, but risk getting hurt again? Or walking away and losing something that may have been worth keeping? This question only YOU can answer. Remember, at the end of the day, this is your life. Don’t let anyone tell you what you should or shouldn’t decide; you are the one living with the consequences. But as long as you remember that we all make mistakes, we never mean to hurt the people we love. Sometimes people do deserve that second chance. Hello Thuy great topic and I can surely understand what you mean. As humans we were made to make mistakes, but we also have to learn from them to make our self’s better. That is exactly right! In order to become better people, we must make mistakes to challenge ourselves. Only then can weaknesses become strengths. And then we are closer to the person we were meant to be. Nothing is more poisonous to our lives than refusing to forgive others. It results in bitterness that can infect all areas of our lives. Thanks for an inspiring article, Thuy. You are wise many years ahead of your age!